The Officer Aptitude Rating (OAR) exam is a standardized test meant to determine the skills and abilities of those who wish to become officers in the U.S. military. It is a subset of the Aviation Standard Test Battery Exam (ATSB-E) and participants will elect to take the OAR as one part of the full ATSB-E or to take the OAR by itself. The OAR consists of three subtests (the ATSB-E has seven subtests in total). Participants are given one and a half to two hours total to take the OAR, while the full ATSB-E can take two hours to three hours and fifteen minutes to complete. Those who are applying for aviation programs will want to take the entire ASTB-E. But those applying for separate programs, such as the Navy Officer Candidate School, may only need to take the OAR subtest. How Is the Content on the OAR Exam Divided? 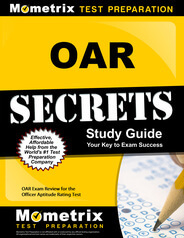 Prepare with our OAR Study Guide and Practice Questions. Print or eBook. Guaranteed to raise your score. Get started today! The OAR exam is divided into three sections: a math skills test, a reading comprehension test and a mechanical comprehension test. The math skills section includes algebra and arithmetic, as well as geometry. Participants will be asked to complete word problems as well as equations. There are questions that require participants to complete time and distance problems, to estimate probabilities and to solve for variables. Participants will also be tested on their ability to complete arithmetic operations, solve for fractions, roots and exponents and to calculate areas, angles and perimeters of geometric shapes. The reading comprehension section includes questions meant to test participants on their ability to interpret meaning in provided test passages. Participants will be asked to decide which response among a group of options applies to a provided reading passage. Some incorrect response options might appear to apply to the passage, but only one response will truly be the best match with the passage provided. The mechanical comprehension section includes questions that grill a participant on their understanding of fundamentals related to gases and liquids. Questions will ask participants to display their knowledge of how liquids and gases affect velocity, volume and pressure. It will also provide questions that determine participants’ understandings of engines, gears, weight distribution, the principles of electricity, the use of pulleys and fulcrums and the operation of basic machines. How Can I Take the ASTB-E’s OAR Subtest? The ASTB-E and its OAR subsection are offered at over 250 registered locations around the world. These include military institutes, Naval officer recruiting stations and Marine Corps officer selection offices. Prospective participants can make a specific appointment to take the ATSB-E at a location that works best for them by working directly with their recruitment officers. How Much Does it Cost to Take the OAR? The OAR and ASTB-E are free to take for qualified candidates. What Can I Bring with Me to the Officer Aptitude Rating Subtest and What Is Prohibited? Participants in the OAR subtest should be sure to bring with them some form of photo identification, such as a driver’s license, passport or military identification card, as well as verification of their social security number. Participants will be prohibited from bringing any electronic devices, such as smart phones or cameras and personal belongings like backpacks into the testing room. Although there are some mathematical equations on the exam, participants are prohibited from bringing calculators to the testing room, as the questions are constructed to be completed without the use of a calculator. Participants will be provided with scrap paper and pencils to utilize during the exam. What Score Do I Need to Achieve on the ASTB-E’s OAR Subtest? Depending on the branch of military that a participant is applying to, a different minimum score on the ATSB-E is required. For those applying to the Navy’s officer candidate school, a minimum score of 35 on the OAR is required. The average score for the OAR is in a range of 40 to 60 and it is scored in a range between 20 and 80. How Can I Get a Passing Score on the Officer Aptitude Rating Subtest? Prospective participants in the OAR will be expected to demonstrate a full range of knowledge across three very disparate knowledge areas. In order to best prepare, it is recommended that these participants utilize a customized study guide, such as the study guide provided by Mometrix Test Preparation.